Christmas is just around the corner with all the joy that it brings. We’ll be taking the “sleigh” into my folks this year. It’ll be the first time we’re all together for at least a year and a half or two. So it’ll be a joyous occasion as we celebrate the birth of our Savior, Jesus Christ. Every time I stop and think about what “Christmas” really is, I am in awe of God and how He sent His only Son into this sinful world as a babe. A helpless baby. I can’t quite wrap my mind around that concept, Jesus the Son of God as a baby. When did He realize who He really was? He sacrificed so much for you and I so that we could have a relationship with the Father. We have so many reasons to praise Him. So many reasons to Worship Him this Christmas season. Let’s not get distracted with the truffles, lights, and beautifully wrapped packages but bow our knees in praise and adoration for the gift He has given us. The gift of His Son to bring us salvation. Yesterday I heard my baby’s heartbeat for the first time! I thank God for the gift of life growing inside of me….its such a miracle. After the visit to the midwife, we went to Costco and Oh how pregnant women love their samples! Haha. A white and blue striped apron caught my eye and piles of chocolate boxes stacked behind her. I casually walked past as if on some other errand and acted almost hesitant when she offered a free chocolate sample….but my mouth was already watering. 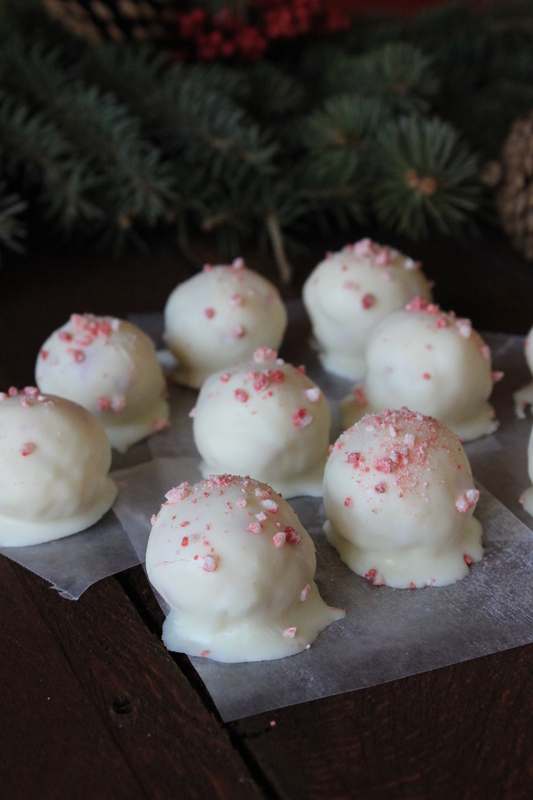 I picked the white chocolate peppermint truffle since white chocolate was my first love before I ever learned to like milk or dark. 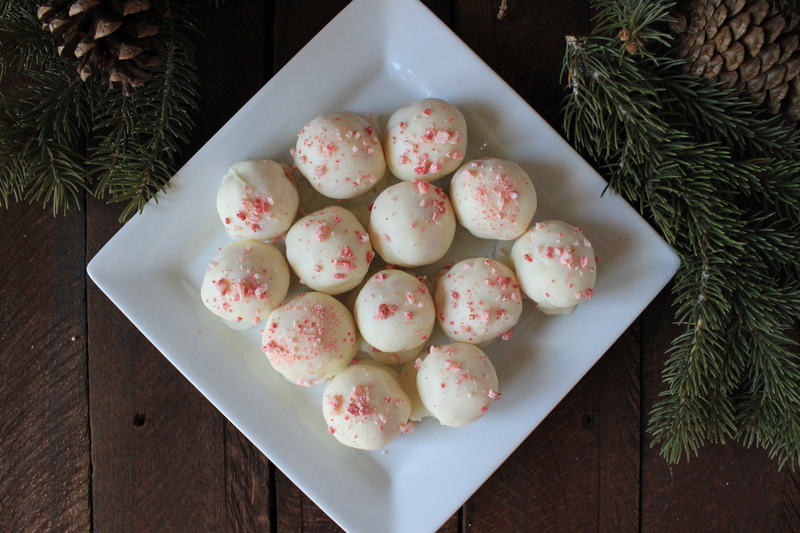 It was so creamy and delicious and the peppermint felt so refreshing and light that I got all inspired about making my own. This is what I experimented with today. The thing I love about these is the creamy texture the cream cheese gives the center. 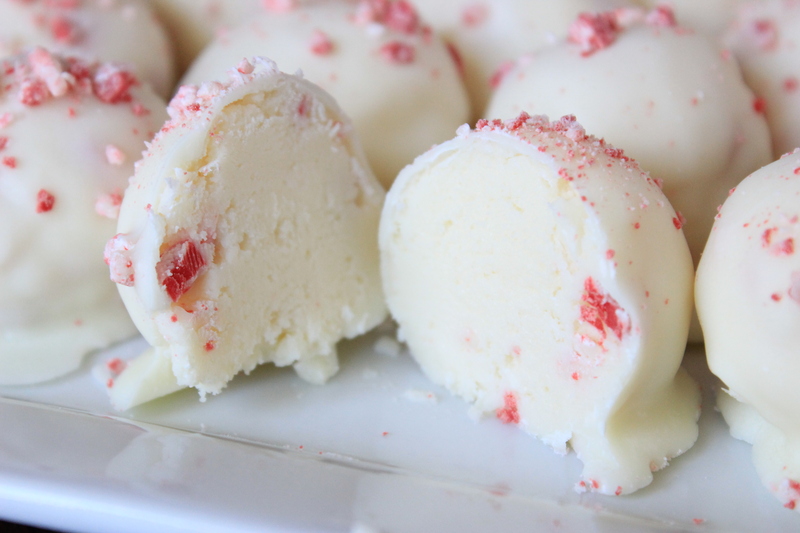 It also helps to take the edge off the sweetness of the white chocolate. 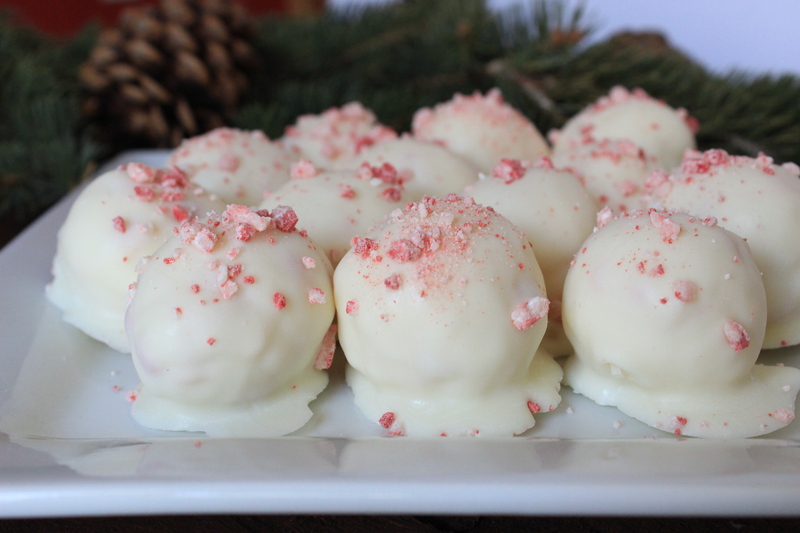 The Andes Peppermint Crunch gives it the crunch that it needs. Oh, and just for your info. I’m no longer only craving potato chips! The scary part is: now that I’m feeling so much better, I’m craving everything! Anything food. Anything sweet. Salty. Crunchy. Creamy. Just anything edible. I don’t know what happened to me the last few days but it seems like I have a bottomless pit. I’m like always hungry. The midwife said the baby is good-size and growing well, so we’ll say that its going to baby. All I know is, that I tried every sample in Costco and swung around a few of my favorite booths for seconds when Crystal wasn’t looking. =) Haha. In medium saucepan over low heat, melt chocolate with coconut oil. Stirring constantly until completely melted. Remove from heat and let cool. In small mixing bowl, whip cream cheese until smooth. Add cream and peppermint oil. Blend. Whisk cream cheese mixture into melted chocolate. Stirring until smooth. Stir until combined. Refrigerate or freeze until chilled enough to roll into balls. 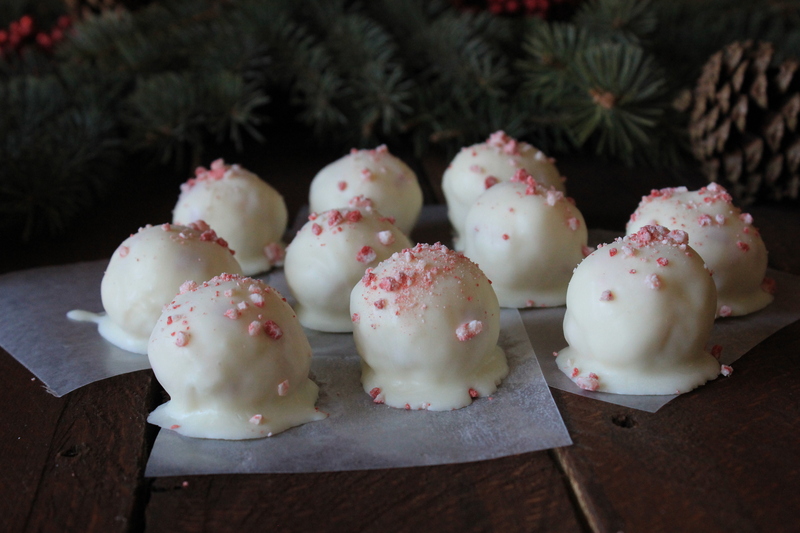 Place balls onto wax paper lined pan. Freeze until hard. Melt chips and oil in microwave safe bowl for 1 minute. Stir. Heat additional minute and whisk until melted. Dip each truffle into melted chocolate. Place on wax paper. Immediately sprinkle with crushed mint chips. Freeze unto chocolate is hardened. Enjoy! NOTE: Store truffles in airtight container either in fridge or freezer. I was looking for the perfect thing to take to my neighbors this year. These truffles are exactly what I was looking for. Thanks for sharing the recipe, and I can’t wait to make them. Thank you! I stopped over and browsed through your beautiful blog! Love it! =) I’ll be back regularly!